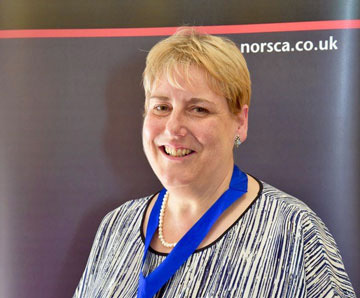 Karen Muir became the President of Northern Society of Chartered Accountants for 2017-18 at our recent Annual General Meeting. Karen takes over from our 2016-17 President David Arthur. We asked Karen to write a few words for NorSCA News and we include the published article below. When I became Vice President of the Northern Society in May 2015, the incoming president at the time, Rob Tindle, warned me that the next two years would go really fast. At the time I just laughed at him, but as May’s AGM and the start of my year as President fast approaches I now understand what he meant. It was a great honour when I was asked if I would be interested in becoming President of the Northern Society of Chartered Accountants. I had previously been very active in the District Society, but after many years of involvement which included being Chairman of both NCASS and the Tyne and Wear Society and lastly President of NCASS I decided that enough was enough and I needed to take a step back. However after getting the “call” I can say it’s really good to be involved with local members again, at all stages of their accountancy careers. My day job is as a Senior Specialist in the Customer Due Diligence and Financial Crimes Compliance Team at the Homes and Communities Agency. We are an arm’s length government body, tasked with helping the Government deliver their targets for increasing the supply of new homes in England. Given that, apart from Brexit, housing (or the lack good affordable housing) is their main priority at the moment it is an interesting place to work. My predecessors have made great progress in improving the engagement of the District Society with both students and our younger members and I would like to continue this during my year in office. However as I work in the public sector, which doesn’t really fit into the typical business member category, I would like to see if there are any ways we can improve our offer to public sector colleagues. The public sector is a large employer across the Northern Society patch so there must be a lot of you out there. If there is anything that you think we should be doing for you please get in touch. Finally to finish with, just a quick plug for the Northern Society Business and Awards Dinner 2017. This will be held on Friday 13 October at the Newcastle Civic Centre where my guest speaker will be the BBC’s Business Journalist and fellow “Boro” lass Steph McGovern. During the evening we will raise funds in support of Butterwick Hospice (registered charity number 1044816). Look out for further details coming soon on norsca.co.uk/dinner and follow us @NorSCADinner.